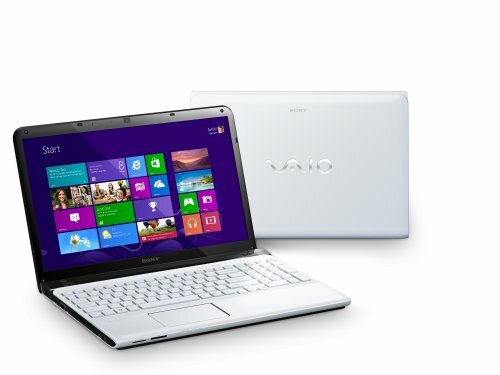 Below is our review of the Sony SVE1512J6EW, a 15" laptop, featuring 4GB RAM, 640GB hard drive and Windows 8. Sony laptops usually stand out from the crowd, and with the SVE1512J6EW they have continued this trend. Whereas the majority of manufacturer's opt for metallic, black and darker colours for their laptop ranges, Sony opt for a contrasting white and black colour scheme for their notebooks. It certainly looks different from their rivals, and for the most part our testers like how the Vaio range look in terms of aesthetics. Similarly, whereas the standard laptop screen size is 15.6", Sony have chosen to go slightly smaller at 15" - not a noticeable difference, but a slight deviation from the norm. The screen is, as you would expect from Sony, incredibly clear, with a crisp picture, and great definition - the colours appear both vibrant and realistic. Boot up from cold is very fast indeed - we were impressed by the speed of this notebook, no doubt helped by the Intel Core i3 2.4GHz Processor and the 4GB RAM fitted. Multi tasking was handled with ease, and we noticed no issues with speed during the test period. Storage is taken care of by a generous 640GB hard drive, which should provide more than enough space for all but the most demanding of users. The plastic interior panel does have a tiny bit of flex, although nothing to be overly worried about - the interior housing a keyboard which was comfortable to use, with the keys evenly spaced out to avoid typing errors. The touch pad was equally responsive, and we had no issues with this feature - you can customise it to your needs by activating or deactivating certain features, such as the zoom facility - and as such is easy to personalise to your preferences. Operating duties, like most of this year's laptops, are handled by Windows 8 - which ran smoothly and without issues. In terms of connectivity you are supplied with the following options: 4 x USB, DVD, headphone, microphone, VGA, HDMI and Ethernet. So who is the SVE1512J6EW aimed at? It doesn't have the most competitive specification for the money, but it does have a certain style that other laptops do not - it certainly stands out. Whether the design is your cup of tea is a different matter. Overall we liked this notebook - it ran without problems, and handled all tasks pretty well. Cons: Possibly slightly more expensive than some of the competition. The Sony SVE1512J6EW worked well, and offered pretty good value, in a stylish design.